Located in Waimānalo on O’ahu is Brothers Paintball on the Bellows Air Force Station. They offer open play on Saturdays and Sundays, and are available for private group reservations Monday through Friday. They have an excellent woodsball field. With natural hazards and uneven footing, and man-made hazards like bunkers, spools, oil drums, and other barricades, you’ll have a blast sneaking around and trying to take out your enemies by surprise. Their field is netted so it’s great for spectators, too. They have plenty of picnic tables set up for when you need to take a break. Their prices are fair whether you’re renting your equipment or bringing your own. 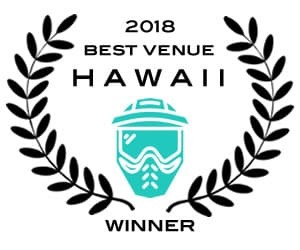 If you’re looking for paintball on the great gathering place of O’ahu, Brothers Paintball is worth visiting. On the island of Maui in Lahaina is Maui Paintball. Maui Paintball is open Fridays, Saturdays, and Sundays for open play, and accepts private group reservations for weekdays. They have some great woodsball and scenario fields, with fun hazards like high bridges, a double decker bus, bunkers, and other cover, as well as natural terrain. They also occasionally do scenario games and special events so make sure you keep an eye on their events calendar. Their prices are fair and you can even score a discount jut by booking at least three days in advance on their website. Maui Paintball is a field paint only park, but like their rental and field fees, their paint prices are very reasonable. If you decide to purchase a marker from them a free two month membership is also included. Maui Paintball is probably the best paintball park in the state, so do yourself a favor and check them out! Waivers must be signed for each visit. If you have a membership one waiver is good for the duration of the membership. Players under 18 will also need the signature of a parent or guardian. The waiver can be downloaded from the Maui Paintball website. In Hilo on the island of Hawai’i is Run-A-Muck Paintball. They have a great airball field. Their employees are great, and cater to both new and advanced players. They offer open play every Sunday. For information on events or specials, check their shop Paintball Heaven. Run-A-Muck Paintball is a field paint only park, so plan on purchasing your paint at Paintball Heaven before you go. Everything they have to offer is very fairly priced, from paint to C02 and HPA. If you’re looking for paintball on Hawai’i, look no further than Run-A-Muck Paintball!